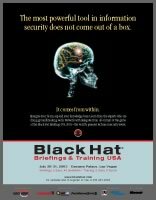 This archive of computer security presentations is provided free of charge as a service to the world wide computer security community. Speaker presentations and materials are put on-line generally two weeks after the event. Audio and video are generally available 6-9 months after the conference. If a speaker is listed on the conference page, but their speech is not present here it generally means there is no available audio, video or materials. If you have questions or have found a broken link, please send a message to ping at blackhat d遵kt com. Many of the presentations available on this site require Acrobat Reader. Please use at least Acrobat 5.0 in order to view these files. If you want to purchase complete video or audio of a conference, or just a specific speaker please visit The Sound of Knowledge website. They have professionally recorded video and audio available for purchase.